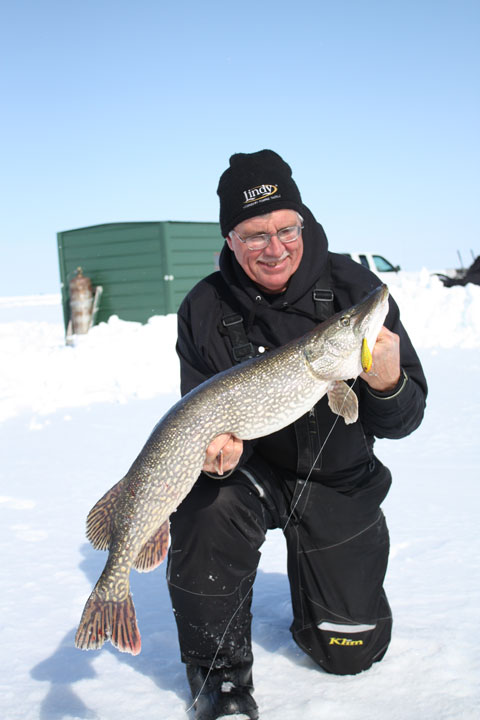 Ice Destination: Lake of the Woods - This legendary lake that straddles the U.S./Canada border serves up outstanding ice fishing through a long season that is already underway . You probably guessed it, but the answer definitely is “d) All of the above.” And in truth, those answers represent only a few of the reasons why Lake of the Woods stands out as one of the world’s most renowned ice-fishing destinations. Straddling the U.S./Canada border, with the U.S. portion in Minnesota, this massive lake freezes early and stays that way for a long time, and the walleye ice season remains open longer than on other Minnesota lakes. 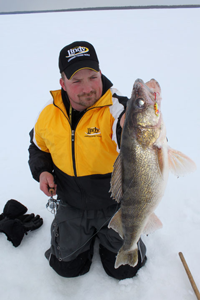 Lake of the Woods also has liberal limits, with an eight fish combined walleye/sauger limit (only four may be walleyes; size restrictions apply). With the sauger population currently in excellent condition based on anglers’ observations and sampling studies conducted by the Minnesota Department of Natural Resources, the opportunity exists to harvest a nice bag of fish most days. The walleye population is likewise in excellent condition, with a large average size and more than a few genuine giants in the mix. Plentiful resorts line the Minnesota section Lake of the Woods, and the gateway town of Baudette is a definite fishing community. In fact, it’s sometimes called the Walleye Capital of the World. From a practical standpoint that means that everything you might want for fishing – from bait to supplies to fishing reports to rental ice houses – is readily available. Making a good thing even better is that despite Lake of the Woods’ tremendous size, much of the best fishing is very handy to the areas where the lake is most accessible, and good fishing areas tend to be easy to find. “The resort industry makes it easy for an angler who may not ice-fish quite as often to get out there and enjoy success in an ice house that has been placed in a productive area,” said Nick Painovich, who operates Zippel Bay Resort with his wife Deanna. Zippel Bay maintains a plowed road from the resort to the lake’s basin, where they have an extensive village of ice houses near the outlet of Zippel Bay. The resort’s entire road system is flagged and even marked with street signs, and stays sufficiently well maintained for you to drive out to an ice house in a 2-wheel-drive vehicle. Of course, opportunities are not limited to resort guests fishing from rental houses. Extensive productive flats are accessible to anglers pulling portable shelters with snowmobiles, and Lake of the Woods is hugely popular with ice anglers who prefer to pick their spots and drill their own holes and remain more mobile with their approach. Painovich noted that through the first part of the season, much of the best fishing occurs fairly close to the shore. Early and late in the day during the first part of the season, he suggests concentrating on water in the 12- to 16-foot range. Through the middle of the day, the best action is usually in the 20- to 22-foot range. In fact, the resort offers shallow/deep packages that allow guests to split time between two locations and concentrate their efforts in those areas that are most likely to produce at different times of the day. “For the average guy who might not want to move around during the day, the 18- to 22-foot range is good,” Painovich said. Shallow, deep or in between, most fishing is over broad flats with a bottom that consists of sand or rubble, and the fish schools tend to roam, not necessarily holding on defined breaks or rockpiles. Mixed catches of walleyes and saugers predominate through the first part of the season, with the biggest walleyes and the very best walleye bite often occurring shallow around first and last light. Through the middle of winter the fish move deeper, and the best mid-day catches will occur in 30 feet or more of water. About 80 percent of the fish caught out deep will be saugers, according to Painovich. The walleyes still will feed shallower early and late – just not quite as shallow. Late in the ice season, the walleyes and saugers typically begin moving shallower again, and the pike bite often gets really good. Large pike staging to move into Zippel Bay to spawn begin working their way up flats during March and provide excellent opportunities, especially for anglers fishing with tip-ups. Because the water in Lake of the Woods is fairly dark, baits that make noise tend to work well. Painovich pointed toward a Lindy Rattl’N Flyer Spoon, Darter and the new 360 Jig as excellent choices. He recommended a two-rod strategy, with an aggressive, noisy bait on one line and something small, quiet and natural – possibly a live minnow on dead-sticked Frostee Jig or Slick Jig – on the other. “Even when they won’t hit that noisy Darter, it helps bring them close to investigate and they’ll end up taking the other bait,” Painovich said. In terms of live bait, he recommends using emerald shiners when they are available, and pointed toward fathead minnows as a good second choice. Zippel Bay also sells frozen minnows for tipping spoons or jigs to add scent and flavor. The biggest size Darter works well for anglers who opt to target pike with a rod in hand, however many Lake of the Woods fishermen do the bulk of their targeted pike fishing with tip-ups. If you do fish Lake of the Woods this winter, leave time to stop by the Zippel Bay Igloo. Located just outside the Zippel Bay among the resort’s ice house village, the Igloo is an on-the-water snack bar and watering hole that offers everything from satellite TV to rental ice holes beneath tables, so you can continue to fish while you eat a snack and watch a ballgame. Want to Go? To learn more about Lake of the Woods ice fishing opportunities and to plan your winter adventure, visit www.zippelbay.com or give them a call at 800-222-2537. The walleye population in Lake of the Woods is in excellent condition, with a large average size and more than a few genuine giants in the mix. Known for it's great Walleye fishing, Lake of the Woods can kick out monster Pike like this one caught by Nick Panovich, owner of Zippel Bay Resort .